Ilog Maria Sting-Less – Citronella mosquito repellent with propolis, natural plant and fruit oils. It has pleasing smell that lasts for hours. It provides antifungal, antibacterial and anti-viral action. Note: I’ve been using bgone lotion and bgone spray for almost 3 years and I find it really effective to repel mosquitoes and other insects. But when I saw Ilog Maria Sting-Less for P70, I did not hesitate to try this product. I love the scent but I think it only lasts for few hours unlike bgone spray and bgone lotion that lasts for 4 to 10 hours. Ilog Maria Healing Massage Oil- An aromatic and soothing blend of essential oils, herbs, flowers, fruit, nut oils, honey and bee propolis. Note: I really love the scent of this massage oil, it really soothes and relaxes your muscles and there is no doubt that it is excellent for healing massage, reflexology and siatsu. 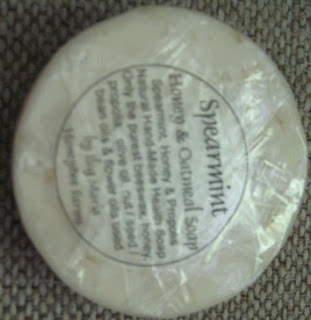 Spearmint and Oatmeal soap – Cooling and refreshing. Perfect for hot days. Alleviates skin asthma. Note: It is absolutely true that this soap is perfect for summer season because it really cools and refreshes your body. I love the minty scent of this soap. It is also for sensitive skin. What is Flu and How to Treat Flu?